Licensed to Lie: Exposing Corruption in the Department of Justice. Licensed to Lie should serve as an explanation of how easy it was for the Obama Administration to prevent Trump's election and frame Trump. Let this book be the beginning of a serious conversation about whether our criminal justice system continues to live up to its vaunted reputation. As citizens of a free society, we all have an important stake in making sure that it does. The author, Sydney Powell, uses a tragic suicide, a likely murder, wrongful imprisonment, and gripping courtroom scenes to draw readers into this compelling story giving them a frightening perspective on justice corrupted and who should be accountable when evidence is withheld. 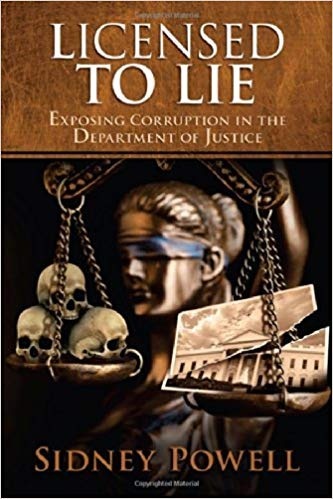 Licensed to Lie: Exposing Corruption in the Department of Justice is the true story of the strong-arm, illegal, and unethical tactics used by headline-grabbing federal prosecutors in their narcissistic pursuit of power. Its scope reaches from the US Department of Justice to the US Senate, the FBI, and the White House. This true story is a scathing attack on corrupt prosecutors, the judges who turned a blind eye to these injustices, and the president who has promoted them to powerful political positions.